What is the one home fix-up project that takes only a couple of hours and yields the biggest bang for the buck of any exterior home renovation? Here’s a clue: This project adds style, energy efficiency and security to your home, and the preparation is easy and mess free – all you need is an Internet connection and a telephone. For most people, the answer does not immediately come to mind: it’s a stylish new garage door. Think about it. If your house has an attached garage, the garage door may comprise more than one-third of your home’s front facade. If that home is more than five years old, your garage door probably is a solidcolored, raised-panel door that looks like every other garage door in the neighborhood. Tom Wadsworth, long-time editor of a garage door industry trade magazine, says the carriage house garage door is “the first major new design in garage doors in more than 25 years.” He says that all major manufacturers have joined “the carriage house craze” and offer thousands of unique variations of the doors. A garage door is an important home improvement project. It is typically the first thing people notice when they pull into your driveway or pass your house. Doors also offer protection against severe weather and theft, help you save money on heating bills and substantially increase the appearance and value of your home. A nationwide poll of realtors revealed more than 71 percent felt a new garage door added to the value of a home, even adding as much as four percent of the selling price. That means $10,000 on a $250,000 home, which is a huge deal for people wanting to sell now during a difficult real estate market. If you think installing a new garage door project is “easier said than done,” think again. What is the most dramatic, eye-catching home improvement project you can launch into this year? It’s an exterior upgrade that adds style and curb appeal to one-third or more of the front of homes: the garage door. Chances are, if your home is 10 years old or older, you’ve been living with a good old-fashioned raised-panel steel door – just like every other home on your street. And they probably all look pretty much the same. All the major garage door manufacturers are producing dramatic new styles and you can review them and decide what’s best for your home. The industry’s hottest trend is the carriage house door. The look that was popular on carriage houses and stables a century ago is today’s new chic in garage doors. The styles, windows, accessories and colors vary so widely, there’s little chance the garage door on your home will look like another one down the block. For homes with more modern or southwestern looks, there are sleek, contemporary styles in a variety of materials. opaque panels and copper cladding provide a modern look that will update the entire appearance of your home. What else is new in garage doors? How about energy savings? Many of today’s garage doors feature insulation that helps reduce heat loss in winter and helps your home stay cooler in the summer. and as energy bills continue to rise, a new door begins to pay for itself soon after installation. If you’re thinking about a new garage door, think about a new opener, too. today’s garage door openers are quieter and provide more convenience and safety features than ever before. Yes, garage door openers have gone high tech. But even the keypad has taken a step up the technology ladder. How about fingerprint-activated entry? it is here and available today. Only those who have scanned their fingerprint into the system can open the door with the pad. that tells you when your garage door is open, a handy tool for those of us who forget to close the garage door at night. Garage door installation is something best left to the pros. a garage door is the largest and heaviest moving piece of equipment on your home. Garage door springs are under a remarkable amount of tension, and these can cause serious injury to even the handiest weekend warriors. Garage door as a hot new fashion statement? Absolutely! Because so many homes are now built with the garage door as the most prominent feature, style-conscious Americans are replacing old, drab doors with fashionable new garage doors to increase their home’s curb appeal. Let’s face it – You don’t get a distinct personality when you buy into a development. Your garage door looks pretty much like every other garage door on your street. A trendy new garage door is not only a fashion statement, it says something about your personality. You’re unique. You’ve got style and flair. Unless you’re selling your house, you’ve got to look at that huge garage door day in and day out as you come and go. Why not liven it up with a stylish new look? Garage door makers heard the demand for more decorative doors, and boy, have they answered! You can now choose from more than a thousand different looks in elegant and stylish carriage-house doors. “People are definitely becoming more style-conscious when replacing their garage door,” said Chris Long, editor Ofinternational Door & Operator Industry, a garage door industry magazine. And replacing your garage door with a new upscale model just may boost the resale value of your home. a recent online survey revealed that a whopping 71% of homeowners who recently replaced their garage door believe it definitely increased the value of their home. It makes sense. for most homes, garage doors take up 30 percent of the front view of the home. With one easy purchase, you can add dazzle to a major portion of the curb appeal of your home. And with professional installation, the job can be done in a few hours. But don’t try to install the door yourself. it’s a complex and dangerous task. a professional door dealer can help you find the right look for your home and install the door correctly, quickly and safely. There’s more to new garage doors than just beauty. We use the garage door as the main way to get in and out of our homes more than ever. another survey said that 71 percent of homeowners use their garage door openers to get in their homes every day. the key to the front door is now the garage door’s remote control. It’s just more convenient. getting in through the garage makes it easy for us to get groceries into the kitchen. You can leave muddy shoes or boots and drenched coats in the garage and keep your house cleaner. and with a keyless entry pad, you don’t have to fiddle with a key, and neither do your kids. “Once you have a keypad, you’ll never go back. it’s a small luxury that quickly becomes a necessity,” said Tom Wadsworth, editor of Door & Access Systems, another industry magazine. And you can kick-up your garage door opener as well with a battery back-up system so that even in a power outage, you’re good to go – in or out of your home, that is. Your kids will never be locked out of your home in a storm again, even in an extended outage. Would you like your garage door opener to switch on lights in your home as you’re pulling up the driveway? or alert you if you left the garage door open? It’s all now possible with new garage door accessories. You can even make a fashion statement with your garage door remote by customizing it to match your car’s interior. It goes up, it goes down. But a new garage door can do a lot more than that. 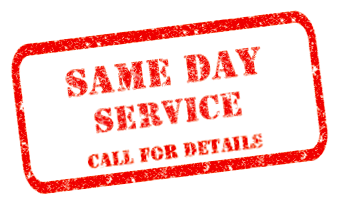 Here are a dozen reasons why you need a new garage door and garage door opener. 6. New garage doors are today’s front door. Housing developments have their advantages, but individuality usually isn’t one of them. In homes that are more than five years old, chances are your door is a solid-colored, raised-panel door that looks like every other garage door. Choose a fashionable contemporary or carriage house garage door, and your house instantly stands out from the crowd. For most people who remodel their home, return on investment is important. The reality is that you usually won’t recover the cost of your investment right away; however, there are projects that recoup faster than others and play a strong role in a home’s resale value. Projects that impact curb appeal tend to impact resale value. When a buyer approaches a house, the curb appeal can affect a potential buyer’s first impression and, consequently, a home’s resale value. Every year Remodeling Magazine releases a Cost vs. Value Report going through the current costs of projects, how projects impact resale, and what percentage of the cost is recouped in the first year. For 2010-2011, the editors at Remodeling Magazine added a Garage Door Replacement project to both the mid-range and the upscale project lists. In the report, the garage door replacement projects ranked high, recouping from 69 percent of the cost on the upscale garage door to 83 percent on the mid-range garage door. The editors attribute this high rate of return to the facts that garage door replacements are among the least expensive projects in the survey, and that they improve curb appeal instantly. 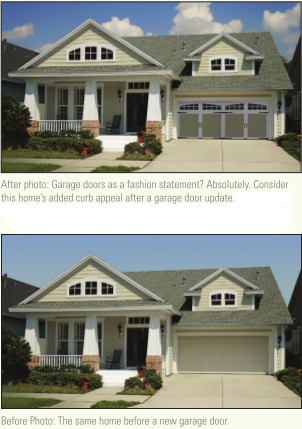 Look at the overall design of your home when considering a garage-door upgrade. Having the garage on the front of the house is not ideal, architecturally speaking, so the object is usually to make the door look as nice as possible without making it the star of the show. An updated garage door that not only looks good but functions well and saves energy will leave a great first impression for guests or prospective buyers. At Garage Door Care, we’ve developed a simple learning tool we call D O O R SAFE that will help you to teach children about garage door safety – four brief messages that you can review with children that will help keep them safe. D OORS are heavy – never stand, run or play under or near any garage door, especially when the door is open or moving. O PENERS are for adults – never play with the button on the wall that opens and closes the garage door. O UCH! – never touch any part of a moving garage door. Your fingers and hands can get hurt! R EMOTES are for adults – never play with the remote control in the car or on Mom & Dad’s keychain. Please help us to keep your children safe. Review the D O O R SAFE information with your children from time to time. Thank you for taking these important steps regarding children and garage door safety. Latchkey Kids or Keypad Kids? Today, many of the millions of children who come home to an empty house are now using an exterior garage door keypad to get in the house. The good old-fashioned key is now running a distant second to the keypad. According to the Chamberlain GarageTrends Survey, 33 percent of parents whose homes have external keypads report that the keypad is the number one way their kids enter the home. Just 22 percent of these children still use a traditional key to get into the house. Other entry methods include having the kids carry a remote control that opens the garage door (8 percent) and leaving a door unlocked (14 percent). The survey revealed that the garage door has replaced the front, side, or back door as the most frequently used entry. Of those surveyed, 58 percent enter their home through the garage using either a remote control or external keypad. As technology improves and the wireless revolution gains steam, Leonard says that number is expected to grow. The majority of people (54 percent) who have purchased an automatic garage door opener or specified one for a new home within the past 10 years have opted for an external keypad as their entry method of choice. In contrast, just 22 percent of homeowners whose garage doors are more than 10 years old have keypads. WADE SAYS: Although it is very convenient to allow your children to use the garage door as their main entry into the home, just remember that every time the door opens and closes it is reducing the life of the torsion springs lifting the door. The result is you will need to change your springs more often than normal.